Following this morning's acquisition of Tumblr, Yahoo today hosted an event in New York City to detail changes to its popular photo sharing site Flickr. 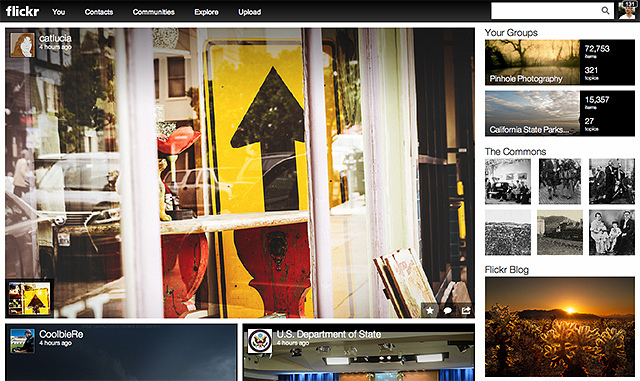 Flickr on the web has been given a major design overhaul, with a focus on full resolution pictures. In addition to eliminating much of the white space on the site, Flickr is now displaying in-line photo streams that encompass the majority of the screen and detailed photo-centric profile pages. Flickr has also implemented a slideshow mode to allow its users to flip through photos hands-free. With the redesign, Flickr is encouraging its users to upload high resolution photos by giving every Flickr user 1TB of storage space for free. That is a marked increase from its former photo storage policy, which limited users' monthly upload bandwidth and allowed only 200 photos to be visible. Flickr will allow up to 3 minutes of 1080p video as well. At Flickr, we believe you should share all your images in full resolution, so life's moments can be relived in their original quality. No limited pixels, no cramped formats, no memories that fall flat. We're giving your photos room to breathe, and you the space to upload a dizzying number of photos and videos, for free. Just how big is a terabyte? Well, you could take a photo every hour for forty years without filling one. And yep, you heard us. It's free. Flickr has upped the price of its ad-free accounts, charging $49.99 per year for an ad-free browsing experience, along with introducing a new "Doublr" account, which offers 2TB of storage space for $499 per year. Jesus every user gets a TB? That's insane. Haha and Google thought they were being generous with 15GB combined storage. And about time Flickr had a major overhaul! That's fantastic they now give 1TB free! I just wish they created an official iPad app. A terabyte per person holy crap where are all the hard drives? At first glance I like the new fluid layout. Images are huge on my 24" display and I guess it would also work better from a tablet. Overall design taste seems improved, consistent with Yahoo's new weather app. What happens to those of us with current Flickr Pro accounts? Are we automatically updated to the ad-free paid account? "Pro members, your subscription remains the same." At 1955 storage prices, 1TB would be about 6 billion dollars worth of disk space.